Rain showers early will evolve into a more steady rain for the afternoon. High 54F. Winds S at 5 to 10 mph. Chance of rain 90%..
Cloudy with occasional rain showers. Low near 50F. Winds SSW at 5 to 10 mph. Chance of rain 70%. With its handsome, craftsman-style homes and tangled shore pines nestled just yards from the ocean, the neighborhood of Bella Beach is about as Pacific Northwestern as you can get. But visitors to this idyllic beachfront community will find a slice of Continental charm waiting for them within the warm and welcoming confines of Café C’est La Vie. Inside the full-service café, co-owner Penelope Cole serves up French-inspired breakfasts, lunches and treats that would melt the heart of the very haughtiest Parisian. Perennial favorites include the Croque Madame, a ham and Gruyère sandwich served on rustic ciabatta bread and topped with a poached egg and parsley. A wide range of crêpes includes sweet classics like the Suzette and savory delights including the Forest, a combination of roasted mushrooms, zucchini, red pepper, French shallots and Swiss cheese topped with a red pepper cream sauce. The onset of fall means guests ordering the Forest crêpe can look forward to locally foraged chanterelle mushrooms, an ingredient Cole used to great success in her recent victory at the Wild Mushroom Cook-Off in Lincoln City. As well as winning over judges with her wild mushroom tart, Cole enjoyed rubbing shoulders with fellow chefs and area foodies. Fresh mushrooms are just one of several seasonal substitutes that Cole relishes the chance to showcase when the weather starts to turn. Other autumnal specials include Cinderella pumpkin scones and a smoked salmon and chive quiche enlivened with a warm, spicy dash of nutmeg. Meanwhile, the peaches that have graced the café’s fruit tarts throughout the summer months make way for Pacific Northwest pears. Elsewhere on the menu, fall brings figs, plums and an array of dried fruits from Oceana Natural Foods of Newport. 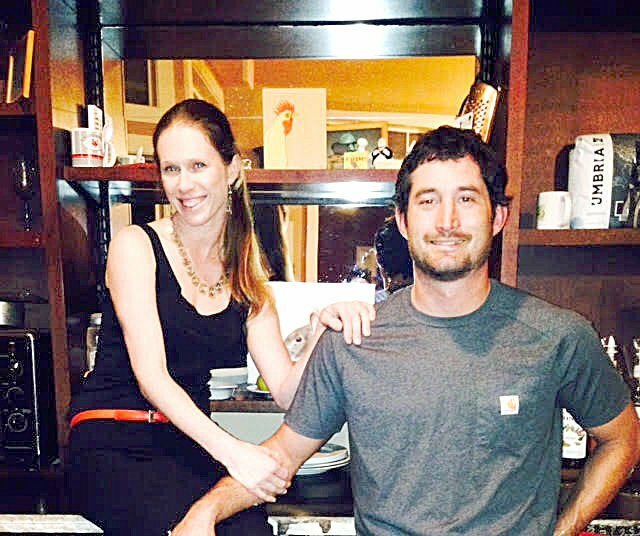 Cole is also proud to work with Amber from Local Ocean to source the very best seafood the coast has to offer. And a select French wine list allows guests to turn their menu picks into a truly leisurely afternoon lunch. Meanwhile, the long winter nights are perfect for indulging Cole’s other passion — movies. After the clocks go back, the early evenings allow her to project films right on to the café wall, accompanied by a gourmet, three-course dinner. The evenings give Cole the chance to explore her love of culinary cultures from around the world. Earlier this year, she and co-owner Tony Perez satisfied their love of adventure and new foods with a quick trip to Nicaragua. Cole said the county’s Latin cuisine might serve as the inspiration for one of this fall’s themed dinners. This year, the first film night will be on Sunday, Nov. 15. For details, check the café’s Facebook page or call to get on the mailing list. Screenings will take place once each month through March, with prices varying and reservations a must for the compact venue. 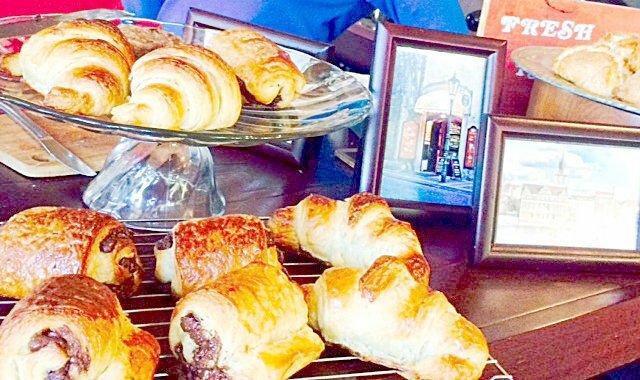 That homey feeling is something that Café C’est La Vie regulars experience every day as they stop by to spend their mornings chatting over coffee and pastries. Cole said she and Perez are hugely grateful for the support they have received over the years from the local community. Café C’est La Vie is located at 8 Bella Beach Drive off Highway 101 in Lincoln Beach and is open from 8:30 am to 3:30 pm every day except Mondays and Tuesdays. In addition to edible goodies, the café has an array of artisan gifts, including earrings, hand-painted decorations and original stationary all made locally. For details, call 619-674-8816.